Less than a month after Mumbai was flooded by unusually high rainfall that killed many people, the metropolis has again experienced near-record rainfall that caused widespread flooding on Wednesday, September 20, 2017. It is the second wettest September day in IMD's over 100-year recorded history. At least 5 people have been killed. 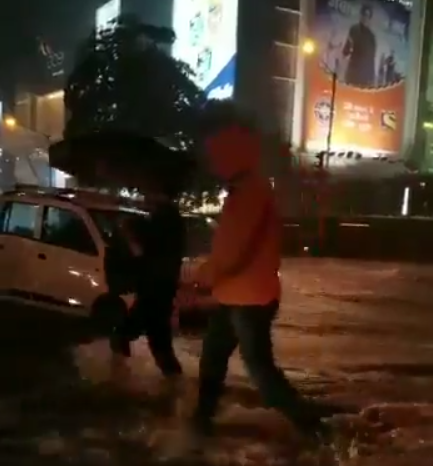 Between 08:30 Tuesday and 08:30 Wednesday, the Santacruz weather station, representative of Mumbai and its suburbs, recorded 303.7 mm (11.95 inches), and Colaba, representative of south Mumbai, recorded 210 mm (8.26 inches) of rain, the highest for south Mumbai this monsoon, according to data collected by India Meteorological Department and reported by the Hindustan Times. The city was just 14.5 mm (0.57 inches) short of the all-time high 24-hour September rainfall of 318.2 mm (12.52 inches) recorded on September 12, 1981. The last days’ rainfall was also the highest in a decade since September 4, 2012, when the city received 185.3 mm (7.29 inches) rain. Mumbai’s average rainfall for September is 312.3mm (12.29 inches). Met officials said the city has recorded 536.4 mm (21.1 inches) in September. The total rainfall this season is at 2879.5 mm (113.36 inches) as against the annual average of 2258 mm (88.89 inches). As reported by the Hindustan Times, waterlogging was reported in Borivali, Sion, Hindmata in Dadar, Goregaon, Andheri, Kandivali, Malad, Kharghar, Mankhurd, and Bhandup. Suburban train services, the city’s lifeline, on all three lines were suspended on Tuesday night. Though the services resumed on Wednesday, many trains were suspended due to flooded tracks while several others were running late, officials said. 56 flights have been diverted to different airports and nearly 180 canceled on Tuesday and Wednesday as Mumbai's main runway was blocked when a SpiceJet aircraft skidded off the runway and got stuck in the mud. Airport services were restored Wednesday night. At least five people have been killed in Palghar district. "They drowned in nullahs and rivers in separate incidents," a senior district administration official said. Bad weather across the region is expected to be over by the end of the weekend.